Getting around in a wheelchair is difficult enough, even when one still has use of their upper extremities. Quadriplegics face an exponentially more difficult challenge: controlling the wheelchair by sucking or blowing air through a straw. But this new powered wheelchair from the Georgia Institute of Technology will respond to a flick of the user's tongue. The existing sip-n-puff control system not only sounds rather silly, it's functionality is limited to just four basic commands. The Tongue Drive system, developed by professor Anne Laumann, instead uses a magnetic tongue stud to issue one of six directives based on the mouth muscle's relative position to an external headset—slide your tongue forward to go forward, slide it back to reverse, etc. The headset then wirelessly transmits that information the user's smartphone where an associated app issues the command to move the wheelchair or computer cursor. 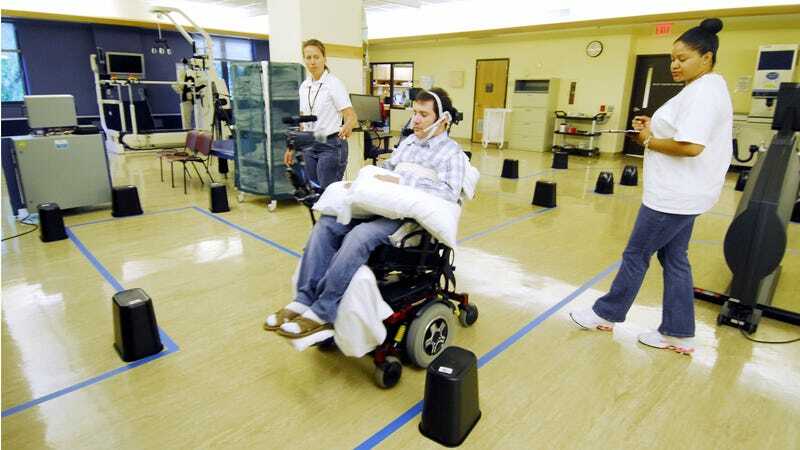 During a recent clinical trial at Northwestern University, 11 quadriplegic test participants were able to perform various tasks, on average, 3 times faster than with a sip-n-puff with the same level of accuracy that took years of daily use to develop with the previous method.